I have decided to resurrect my meet the maker series of posts about other craft businesses or rather their owners. The first interview in this series is with Christine Brown of Alfie Moon Designs. 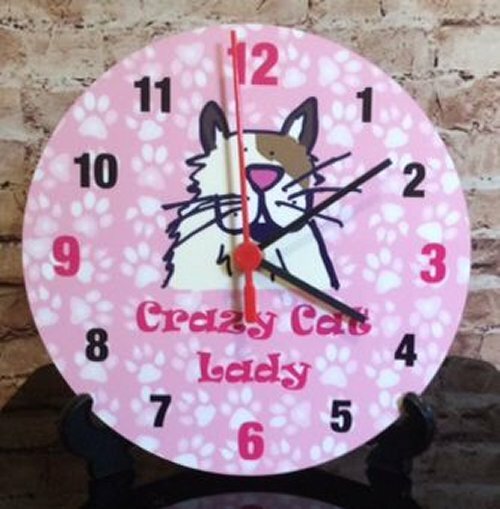 Christine and her husband Julian have started the business in 2015 and specialise in mostly cat related gifts, but also feature other animals in their cute and quirky designs. 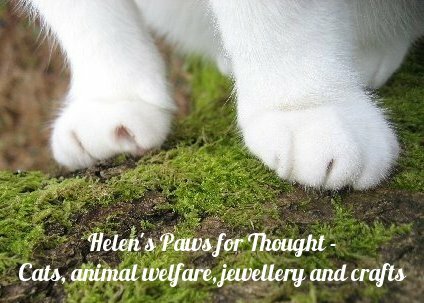 Here she talks about her love of cats, passion for crafts and meeting Theo Pathitis. I class what I do as mixed craft – but whatever shape of form that takes it always has art and design at its heart. I loved every aspect of art at school – drawing, painting, pottery and sculpture and we were lucky enough to have a chance to have a go at lots of different things. I also learnt a lot of traditional crafts as a child – patchwork, embroidery and needlepoint, knitting, making rag rugs. My husband says I could open my own craft shop, but if you’re a committed crafter you’ve probably heard that before! I always gravitate back to doodling, drawing and designing, which has allowed me to turn my passion into a family business. My husband and I started Alfie Moon Designs in 2015. We both come from a corporate environment but are both creative people. I had been running my own business development consultancy since 2011 but had dreamed for years of running a creative business. I had started to draw and design again, focusing on quirky, fun character-led designs. I started by making the designs into bags, t-shirts, mugs for myself and gifts for family and friends. People liked what we were doing so we took the step to formally launch Alfie Moon Designs, set up a website and got out there selling. Whilst I still love making things, my hubbie now leads the business – with me as Chief Doodler and him as Chief Maker and Seller! The business is named after our beloved cat, who is sadly no longer with us – Alfie Moon Cat. He, along with our current cat, Tommy Moon is the inspiration, for many of our designs. I do have to confess though that Alfie Moon Cat’s name was inspired by one of my favourite TV characters at the time! My favourite makes are any which have my signature Crazy Cat Lady design on. It was never intended to be printed – it was a fun doodle one evening based on Tommy Moon Cat. It gets such a great reaction and is one of our best-sellers. He features on bags, t-shirts, compact mirrors, mirrors and clocks! Who or what inspires your craft? We are animal mad, particularly about cats and dogs – they are the main inspiration of ideas and designs. We are also a family of musicians and music lovers. Our website features a Kitty Shop and a Music Shop in homage to both these loves. What tools do you use the most? What are your favourite tools? I design both digitally and traditionally so the most used tools are my laptop and paper/pens. 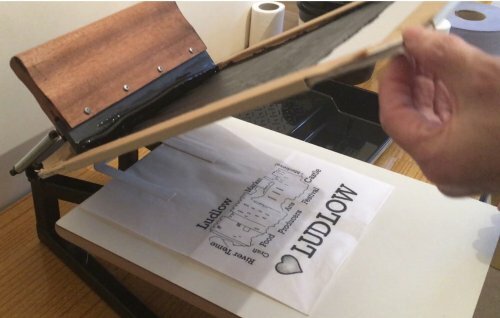 But my favourite print tool is our screen-print unit – we both love to print using this method and fight over who does it– it is very therapeutic! I enjoy the fact that ‘work’ can be relaxing. While I’m working on a new design or testing out new production methods I am in a world of my own. Then you have the sense of achievement and reward of going from a blank piece of paper to finished product; producing a gift that other people want to buy. What has been your best seller? 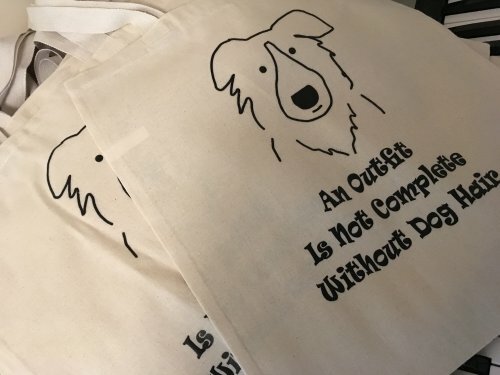 Along with our Crazy Cat Lady range, the other best seller by far is our screen-printed Roy The Dog tote bag. This is a really simple Border Collie design I originally sketched using a black sharpie. It combines dogs and humour – what’s not to like! We were chuffed to bits to win Theo Pathitis (ex-Dragon Den star) #SBS Hour on Twitter. Every Sunday you have the chance to get a RT from Theo to his many 1000’s of followers. As a winner, we get to go free of charge to an annual conference with lots of networking opportunities and access to specialists. We have access to a winner’s website and online shop, plus lots of regular networking opportunities. It’s help raised our profile across the UK and we’ve picked up new customers along the way. What was it like meeting Theo Pathitis? Did he give you some useful advice? I was a bit star struck when we met him to receive our winners certificate. We didn’t have any one to one time to talk as the event was really busy but he was really interesting to listen to in the various sessions during the day and despite all his money and success came across as really genuine. He talked about his own business experiences. What can you advise other small businesses who want to take part and win #SBS? Persistence is key – it’s unlikely (but not impossible) to win on your first attempt. Try to make your tweet stand out as much as possible and focus on what is special about your business. We won with a Crazy Cat Lady related tweet – fate or what? 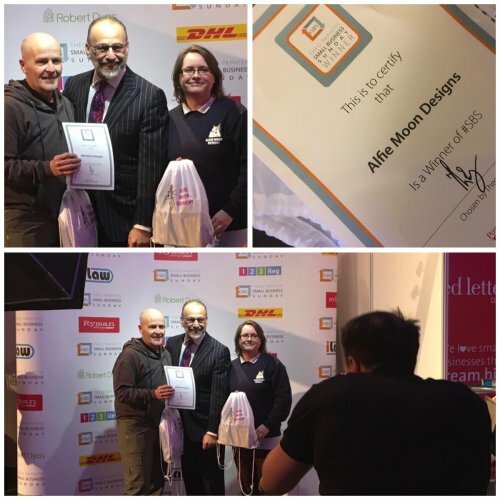 Winning the #SBS Twitter hour – Julian Brown, Theo Pathitis and Christine Brown. Can you tell us a little bit about your cats in your life? My first adult owned cat was Alfie Moon Cat, who was the sweetest and cuddliest chocolate British Shorthair you will ever meet. After we lost him, I said I’d never have another cat but along came Tommy Moon Cat. 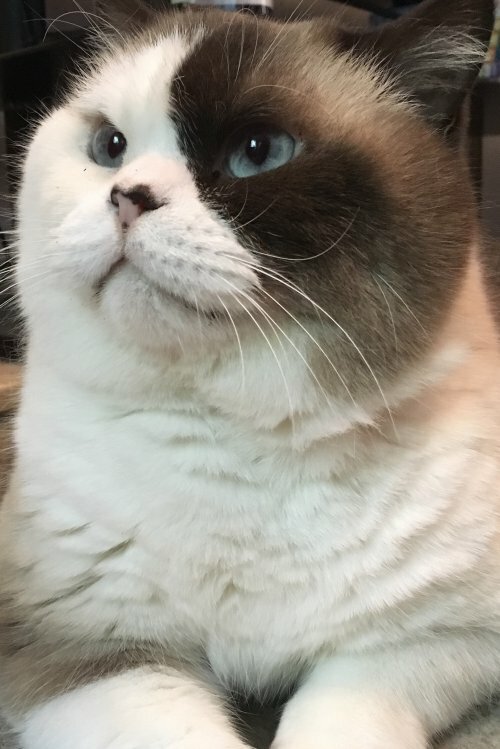 Tommy is an ex-stud colour point British Shorthair. Never did two different cats exist. 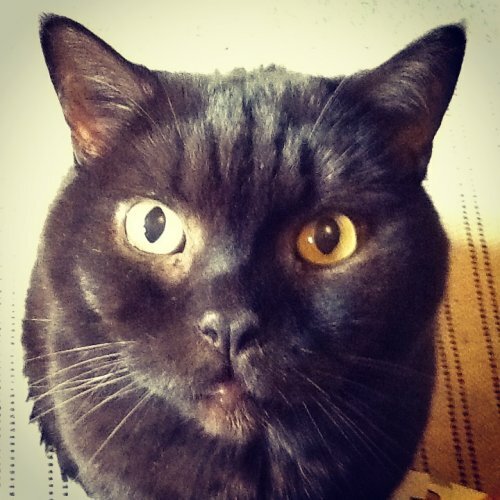 Tommy is the funniest, full of attitude cat I’ve ever come across– we call him our clown. He is like a baby elephant rampaging around the house and makes us laugh everyday with his antics. He wasn’t socialised when he arrived, so it’s taken a long time to build trust and despite his boisterous attitude is the original ‘scaredy’ cat. Alfie Moon – the insprration behind the business name. What do you love about cats so much? You can’t make a cat love you – it’s on their terms and so when they give you a cuddle its because they want to. They are funny, clever and fiercely independent – qualities I wouldn’t mind in myself! Tommy Moon – “the baby elephant”. What is your top tip for other crafters who want to turn their hobby into a business? Get some basic business knowledge but really you need to just get yourself out there and your products in front of people – see what works and get feedback on your products at every opportunity. Do markets, get a website, get involved in local networks, join the pro crafters guild, engage with social media – the list is endless. No-one is going to come to you – you have to get yourself out there. And listen to what people say – if it doesn’t work (stop doing it), if it does work (carry on doing it) and do some new stuff (ask your customers what this should be). I said get some basic knowledge first because you need to make sure you are trading legally but you don’t need to know everything straight away. A friend who started her business many years ago tells a great story about a business start up course she went on. Everyone wanted to know was this tax deductible, was that tax deductible – the tutor quickly stopped everyone saying first of all you’ve got to make some money for anything to be tax deductible! – good advice. We plan to have a total revamp of our design ranges and website – its hard to say goodbye to designs but it has to be done to make way for new ideas and products. We also provide personalisation of products but want to take this to a new level and this is another area we will be focusing on the near future. You can find us on-line at www.alfiemoondesigns.co.uk or at Ludlow Market in Shropshire every Wednesday. By appointment only, you can also visit our Bridgnorth office studio in Shropshire. Thanks for featuring our work – it was great fun to be interviewed for your blog. Thanks for taking part 🙂 I look forward to my mugs and bags.